Gorgeous Home with all the amenities!!! Bring the whole family, there is plenty of room. Receive 10% off your Reservation when you book 4 nights or more!!!! Lakefront Unit with a Covered Boat Slip!!! King master bedroom with a small balcony that overlooks the entire main floor of the home. From the room you also have your own private view of Norris Lake .This master bedroom also has a very large bathroom which includes a Whirlpool tub, a double sink vanity, and a private water closet with a toilet ans a stand up shower. Large open Living Room, Dining Room, and Kitchen. The Living Room has plenty of seating for the whole family as well as a small wet bar. The dining room table will seat 8, and the kitchen counter bar will seat 4. This home has a fully stocked kitchen with everything you could possible need to create a lovely homemade dinner after a long day of playing on Norris Lake. There is deck access on the main floor of this home that offers beautiful views of Norris Lake. From the deck you can see the down the main channel of the lake. There is also an outside bar on the deck with plenty of seating to enjoy the beautiful views. There is a very large family room with plenty of seating to watch TV as well as a second table to play games on or enjoy something to eat right off the grill. This level also has deck access that has an outside dining table and a large gas grill. This level also has deck access, and direct access to the pathway leading the the dock located in the Deerhill Villa Cove. Bunk Beds for the Kids!!! HOMES AND CONDOS THAT OFFER EXTRA SERVICES SUCH AS WIFI, FREE LONG DISTANCE CALLING AND SATELLITE TV MAY CHOOSE TO TURN OFF SERVICES DURING OFF PEAK SEASON! THERE ARE NO ADJUSTMENTS FOR SERVICES NOT RENDERED DURING OFF SEASON TIME. 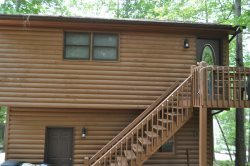 DEERFIELD VACATION RENTAL OFFICE 1233 DEERFIELD WAY, LA FOLLETTE, TN 37766 Reservation is not confirmed until security deposit is received by our office. Payment in full is required 90 days prior to arrival. See TERMS AND CONDITIONS. CHECK IN: AFTER 4 PM E.S.T. Property can not be used until final release from the rental office. This includes home as well as decks. Please enjoy the lake and the amenities at Deerfield Resort until check in is permitted. RENT 6 NIGHTS AND YOUR 7TH NIGHT IS FREE!